Public health researchers, academicians, policymakers, practitioners and more met during the 11th EPH Conference in Ljubljana on 28th November 2018 to discuss new ways of improving public health in Europe. 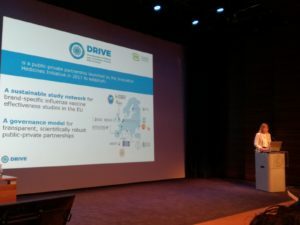 The DRIVE Project was selected from 1,473 abstracts submitted from 69 countries to present the results and lessons learned from its pilot study to establish influenza vaccine effectiveness for specific brands used in Europe. The presentation covered influenza vaccine procurement systems in Europe for the national influenza campaigns and how they can inform availability of brand-specific vaccine effectiveness studies. Organized by the European Public Health Conference Foundation, the European Public Health Association (EUPHA) and the Slovenian National Institute of Public Health (NIJZ), the Conference was attended by more than 1,500 experts in public health who addressed the leading challenges and explored strategies to confront health issues around the globe. The conference held over 100 sessions focusing on the latest public health challenges, including oral presentations, roundtable workshops, poster sessions and panel discussions.